we have all seen this scene over and over again on tv ,the news headlines and even in our personal encounters,i am looking at the news today and i see this scene in a mac donalds somewhere,this gun man points the gun and pulls the trigger over and over again but the gun didnt go off,a week ago a young lady in my neighbour hood was shot in the head by her husband and made a full recovery,we have all seen and heard the sad stories about plane crashes and car srashes where everyone dies except that one ore two persons we have all heard about people waking up from comas after weeks,months and even several years,so we have to believe that if its not your time to go mother nature will help you as much as she can.so i encourage every one to at least take the time to learn what is coded in your birth date,get an idea when it will be your time to go. its fascinating to me how the media both here in the usa and the uk act like a pack of wolves,they seek out prey and as soon as the next piece of fresh meat is sniffed out they forget about the prior story,for example a few weeks ago all the media was talking about princess diana and the circumstances surrounding her death and now that story has vanished from the tv screens and front pages. in my up coming book,the focus will be on celebrities and their life and death as seen through the mu-ji-man codes.i will be beginning with princess diana and will show in her chart ,her coded age and weather she died sooner or later than she was coded to die as pre coded in her birth date.within her chart are also clues as to weather she was assinated and clues as to who her killers are. her chart reveals the warm ,caring and compassionate person princess diana was and lots of other surprising info about the princess,stay tuned and check back often to learn when the release date will be for the upcoming book. The current issue of time magazine is featuring on the cover as they put it (Google v death). Of course in a real duel between Google and death I think we all know who the winner will be and I think the headline will read like this Mr. death knocks out Google, funeral arrangements to be announced later. I was very surprised when I saw this news on CNN early this morning because it gives me hope that more people will learn about the Mu-Ji-Man codes because what Google is about to embark on with the creation of a new company devoted to studying death and how to delay death is exactly the premise of the Mu-Ji-Man codes. But with some additional benefits of not just delaying Mr. death but learning to manage him and to remove the fear we have of him. Some may say that what Google is proposing is contrary to the Mu-Ji-Man codes but I disagree, because the Google model will be based on actual data being mined and utilized to assist us humans to live more better, longer and productive lives. 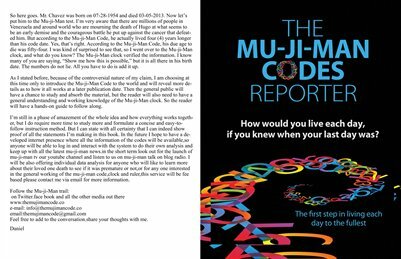 When we look at the initial studies done as reported in my book the Mu-Ji-Man codes, I see the pattern in the numbers which clearly shows that the greater majority of people die before their coded age. As I stated in the book am not a trained medical professional, so I have no answers to why that is so, but I think when we look at the lifestyle and foods that we consume, I think therein lies the clue. So yes I am very excited about this Google project and I will be following it very closely as it progresses. I firmly believe that we as humans must reeducate ourselves and break free from some of the old knowledge passed down to us over generations regarding our bodies and our spirituality. That somehow we do not have direct control over our existence and our bodies, for example can anyone tell me how old you were when you became aware of your heart? At what age did you understood the function of the heart, but most importantly at what age did your parents or family doctor sit you down and break out a chart of the heart and explain to you not only the importance of your heart but showed you what the results of not taking care of your heart from an early age will look like? Tough questions, but be honest with the answer and you will agree with me that we as a society and parents must know and study the heart more than we study the manual of that new car we want or that latest sears refrigerator we are craving so much. Yes its time we we all become experts on the heart as it pertains to its functioning and daily care and teach our kids from a very early age so they too will be experts and pass it along to the next generation. Think of the possibilities, not only will people live longer we will also live better and stronger, Obamacare will not be an issue because if we reeducate ourselves as parents and then educate our kids. Not only would we reduce the need for more hospitals, doctors, pharmacies and drugs, we would be doing the greatest service to the planet through future well informed generations. They will recognize that the fast food industry, the sugar, salt ,starch, meat and snack merchants are not serving the greater good and will be equipped to make the right decisions because they will know the connection. Please pardon me for going off on that rant, but that’s how I feel and I hope that as Google embarks on this journey of discovery and data mining they will not overlook some of the simpler things that affect our longevity. I hope that we as a community, will not just sit around and wait for someone or some company to tell us how to delay Mr. death, but instead we will ourselves embark on the journey to reeducate ourselves about life. And, more importantly also about Mr.death and how to remove the fear of him and learn how to manage death. I would like to extend my condolences to the family and friends of ken Norton who died yesterday, Wednesday Sept.18,2013. May god guide and protect him on his journey. I took the liberty to do a basic reading on Mr. Norton from his birth date of 08-09-1943 and his death date of 09-18-2013. Which put him at age 70 at his death, my reading confirmed his death age encoded within his birth date and confirmed his coded lifespan age of 72 so he died two years before he was coded to based on the Mu-Ji-Man codes system. Yes folks, this is the Mu-Ji-Man codes in action and I encourage all the readers to simply look at the date of birth and challenge your self to see some clues. 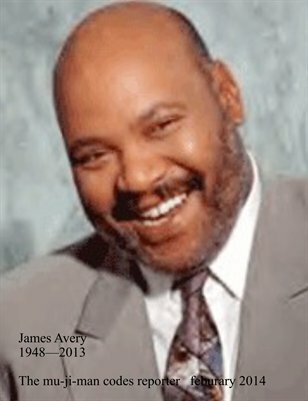 Please continue to check in for updates on any famous celebrity death and other interesting life and death issues. I would like to extend my condolences to all the families of the victims of the Navy yard shootings and also the family of the shooter. This is a tragic and difficult time for all sides and I hope they will find peace during this difficult period. Sometimes a theory is just that, a theory. A concept or idea a person has in their head and try as they might, it seems impossible to bring it to accepted reality by producing actual facts and figures but with the Mu-Ji-Man codes I’m often asked the question, is it just a theory or can the facts support the claims? The answer is somewhere in the middle, the idea behind the codes are quite simple and is based on us as humans taking the time to look at ourselves in a more realistic manner and to realize that we are machines manufactured by nature, god, the universe or whatever your preference. And, like any other created carbon based life form, we have an expiration date or due by date, with some items that date is printed on the item, in a manual or in the contract. But with us humans, it seems that the most logical place to imprint that information will be the human heart, because life begins with the first beat and ends with the last beat, so that part of the theory will remain just that a theory. On the other side is the fact that we use mathemathical calculations to unlock the information contained in the date of birth and that reality I hope after more research and testing will one day move the Mu-Ji-Man codes theory to the area of accepted fact. # 1 The codes are are new to me and I am still in the process of figuring out how it all works together. #2 I did not relish the idea of me trying to explain something as serious as this with the claims I am making and getting it all wrong because I did not give myself the necessary time to think it all thru. #3 Imagine having readers trying to decode the code instead of focusing on the main message of the book, which is do not just drink the cool aid and think for yourself, take the time to study your human engine and take better care of it. #4 I was very fascinated with how the whole thing came about for me and I wanted to challenge the reader to simply look at a persons date of birth and see what the numbers revealed especially in the case of their departed friends and loved ones and I must say that it is very possible like in the case of an early reader named Indra from New York, she bought the book read it from front to back and spent many nights trying to figure it all out and I must say she is getting quite good. The codes are all mathematical calculations and I am currently formulating them in a simple to do format which i hope to share with the reader in the future. So in the meantime please read the Mu-Ji-Man codes, order a personal reading and take a good look at the numbers you may surprise yourself.